The National Science Foundation has awarded coveted Graduate Research Fellowships to Tristan Yates (left) and Liz O’Gorman, who just graduated from Emory College with honors with degrees in neuroscience and behavioral biology. Photo by Tina Chang. The National Science Foundation has awarded coveted Graduate Research Fellowships to two students who just graduated from Emory College of Arts and Sciences. Liz O’Gorman and Tristan Yates, who graduated with honors with degrees in neuroscience and behavioral biology (NBB), are among 2,000 early-career scientists and engineers selected for their high potential in the fields of science, technology and engineering. More than 12,000 applicants applied to the program, the nation’s oldest continuous STEM investment. The fellowship provides three $34,000 annual stipends and $12,000 cost-of-education allowances to the fellows’ graduate institutions, as well as programs for professional development and international research. O’Gorman, who also completed an ethics minor, will use the fellowship to pursue a PhD in neurobiology at Duke University. Yates, a Dean’s Achievement Scholar and two-time honorable mention for a Goldwater Scholarship, will apply her fellowship towards her PhD in psychology at Yale University’s cognitive neuroscience program. “It is a very prestigious honor, having the NSF declare they have so much potential that it will pay them to conduct research as graduate students,” says Leah Anderson Roesch, a senior NBB lecturer and director of undergraduate research for the department. 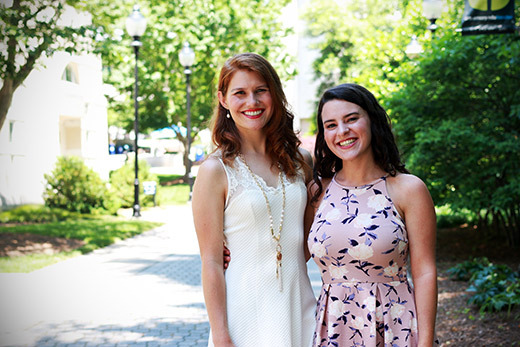 O’Gorman and Yates went through the comprehensive fellowship application process as they were each completing their honors thesis projects. For three years, O’Gorman, who began her Emory education at Oxford College, was an assistant researching neurophysiological mechanisms underlying emotional processing in rats. Last fall, she began working with Gordon Berman, an assistant professor of biology, assessing the underlying neural circuitry of pair-bonding in prairie voles based on data from Robert Liu’s lab in the College’s biology department. In both projects, O’Gorman worked to tease out a physiological understanding of behavior and response. In Berman’s lab, though, she also had to learn mathematical methods his team developed to identity patterns of brain activity associated with bonding activity. Yates worked on her thesis with doctoral candidate Jillian Lauer and Patricia Bauer, Asa Griggs Candler Professor of Psychology, in Bauer’s memory lab. A major focus of the lab is the study of how children and adults learn and remember information. Yates’ project focused specifically on whether the way new information is presented to preschoolers affects their ability to combine memories to understand new concepts. For instance, she tested whether the children could combine two related facts embedded in different stories to derive a third fact. “She was asking a fundamental cognitive science question but one that could be connected to how children learn at home and in school,” says Roesch, who was on Yates’ thesis review committee. In fact, both O’Gorman and Yates hope their graduate study will have real-world applications. Whether studying the electric profiles of the brain, intercellular processing or the deep-brain stimulation known as neuromodulation, O’Gorman’s research will zero in on accessing how the brain processes emotion or behavior. The goal is new treatment options for mental illnesses such as depression or brain disorders such as autism. Yates plans to expand her research by studying memory development in a lab that specializes in complex neuroimaging techniques. She also plans to include even younger children, entering into a more cutting-edge area of psychological research in part because of the challenges of having them perform tasks while being recorded in functional MRI machines. Beyond that, though, research has only just begun in understanding how brain development relates to learning and memory across the lifespan, which may ultimately add to the understanding of the development of illnesses such as dementia.